Mark Turvey noticed this spider crossing his driveway in League City, Texas, on 17 January 2010, in broad daylight. It was 2:05 PM and the spider was facing toward the east, as the shadow cast by its body attests. It is immediately apparent, on inspecting the carapace and dorsal abdomen, that this spider is most likely a member of the Theridiidae family of cobweb weavers. A firm identification, of course, is impossible from one or even several photographs of the spider’s dorsum, without examining the eyes more closely, or viewing the morphology of the genitalia. However, the gross anatomical features of this specimen are perfectly consistent with the Theridiidae, and with few other arachnid families. The celebrated arachnologist Herb Levi points out, in his article on the Theridiidae in the authoritative “Spiders of North America” (Ubick, et al., 2004), that the Nesticidae family is similar to the Theridiidae. Both have, for example, relatively large and globular abdomens that rise quite above the carapace to the point that the former overshadows the latter. In the case of Turvey’s specimen, that description is true not only anatomically but in a literal sense as well. A difference between the Theridiidae and Nesticidae easily discerned with the naked eye is the gross morphology of the carapace. In the Nesticidae the visible carapace forms, in the horizontal plane, a rather smoothly proportioned ellipse, while that of the Theridiidae–and of this specimen–is broken by the convergence of the forward-projecting head with the broader structure of the thorax that surrounds it laterally and behind. Note that, in both photos supplied by Turvey, two of the eyes of this spider fairly sparkle with bright reflected light. The photo at left is an enlargement of the photo published at the head of this page, showing the carapace, after enhancement software was used to bring out subtle features not otherwise apparent. When software enhancements like this are employed, the overall quality of the image can suffer, as in this case. 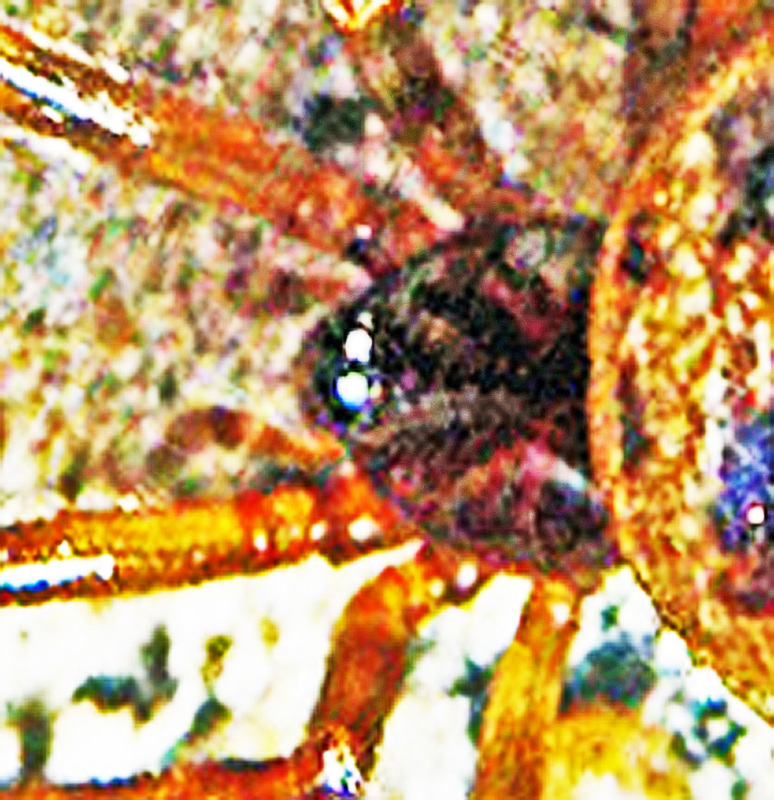 Though spiders in the Theridiidae have eight eyes in two rows of four, the two posterior median eyes are positioned in such a way as to produce this effect when the spider is viewed from above. As pointed out in the book “Biology of Spiders” (Rainer F. Foelix, 2nd Ed., 1996, p. 84), the anterior median eyes (which in this species face forward) are the main eyes for the spider; but, inasmuch as they are not supplied with a reflective retina, they appear black in a photograph (and are not even shown in these photos). All six secondary eyes, however, have reflective retinas. Of these, four face outward to the side and are not visible from above. The two posterior median eyes, because they face upward, reflect light to an observer above the spider’s head. The markings on the spider’s dorsal abdomen consist of five or more sets of dark blotches. These blotches are mostly connected with one another on each side of the dorsal abdomen, and the two sets are thinly connected anteriorly by a narrow mark across the dorsal midline. The pale dorsal midline that begins at this narrow anterior mark and extends thence to the posterior abdomen has the form of an inverted tree with three sets of lateral branches (or, alternatively, as a deeply incised oak leaf). This pattern is noted (Ubick et al., 2004, p. 242-3) as roughly characteristic of certain species in the genus Theridion (65 species worldwide, 61 represented in the U.S.) Unfortunately, however, detailed descriptions of various species of the genus Theridion are sparse to nonexistent in the most recent literature of the past 50 years. 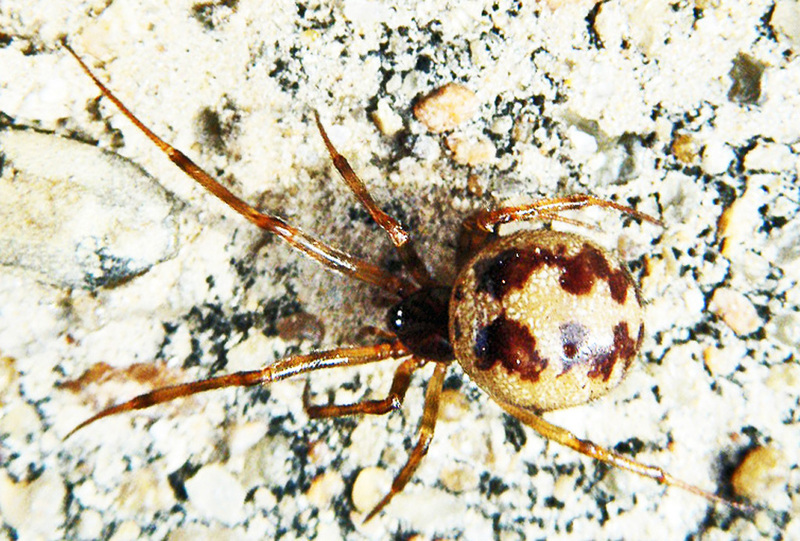 On the other hand, one well-known species in the genus Steatoda bears markings identical to those displayed on this specimen. 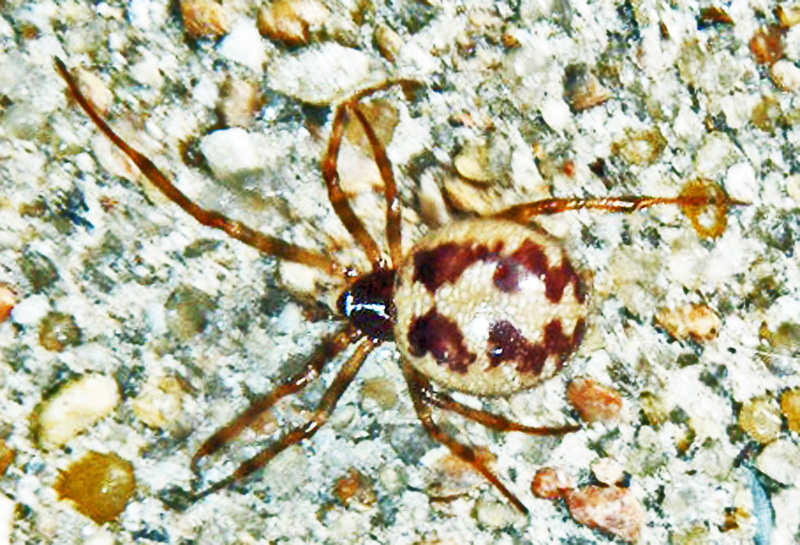 The triangulate household spider (Steatoda triangulosa), as depicted in “A Field Guide to Spiders & Scorpions of Texas” (John A. Jackman, 1997), shows these markings quite well. The triangulate household spider is praised in the literature for its mild disposition, its prodigious reproductive capacity, and its predation on the brown recluse. Although it will bite if handled roughly, the venom of this spider is not considered medically important.